It has been an exciting three weeks as we have rehearsed Mason Bates’ Mass Transmission for its premiere tomorrow at the American Mavericks Festival with the San Francisco Symphony Chorus. In my earlier post I included a YouTube video interview with Mason where he describes the background and emotional content of the piece. Before we launch the piece into the world tomorrow evening, I’d like to reflect on some of the musical aspects that I love about both this piece and other works by Mason Bates. I started working with electronic and computer music back in my undergraduate days at MIT, where I did my B.S. thesis in computer science at the Experimental Music Studio, directed by Prof. Barry Vercoe. One major goal of the studio was to make electronic resources more accessible and expressive for composers, back in the days before MIDI. My thesis project was one part of that. It was an alphabetic score entry language for the Music 11 system that was more composer-friendly that Music 11’s raw score language, which had lots of lines of numeric parameters. A lot of us were wondering about what music composers might be able to create, once technology made electronic resources expressive enough. I envisioned new sounds that could be used with more traditional media. A common dream was to make live performance flexible enough to be played together with musicians, without the musicians always having to defer to the tape. That deferral was necessary in most electronic music of the day, save for some amazing pioneers like Ivan Tcherepnin. The MIDI and electronic music revolution brought electronic music to the masses, of course, but I never heard the type of music I was thinking about in my lab days. Usually the electronics were impersonating or modifying more traditional instruments. And as electronics became more pervasive, musicians were still subjected to the tyranny of the click track. Where were the new sounds? Where was the expressive freedom? Where were the more imaginative approaches to combining electronics and live music? The first time I heard Radiohead’s Kid A was an astonishing jolt of recognition. That was it – this was by far the closest I’d ever heard to the music of my imaginings some 20+ years earlier. It’s a landmark not just of pop music but of all music in its use of electronics for new expression that is still bound to traditional forms that make music enjoyable for most people. Over the past few years I’ve been lucky enough to hear several of Mason Bates’ compositions for orchestra and electronics, both at the San Francisco Symphony and the Cabrillo Festival of Contemporary Music. A few weeks ago I heard the Chicago Symphony perform his latest orchestral work, Alternative Energy. It turned out to be his best orchestral work that I’ve heard yet. Once again I had that jolt of recognition. The beginning of the second movement, where the orchestra segues from a huge crescendo into a burst of sound based on samples from the FermiLab particle accelerator was literally jaw dropping. I’d never heard anything like this before, and done in such an intensely musical way. Here once again were the new sounds set within traditional forms, but now in a classical context at a live concert, rather than in a pop context on a recording. It was only in our two full rehearsals with organ and electronics that I realized that Mason Bates has a particularly flexible and expressive way of combining electronics with live performers. Some parts with electronica reflect the freedom of rhythm that MIDI has made possible. These are marked with CONDUCTOR FREE in the score, and often involve radio-inspired sounds. Other parts though need to be locked into the electronica beat, and are marked with CONDUCTOR LOCK TO BEAT. These include the techno and processed gamelan sections of the electronica. Aren’t these sections what I was early calling a “tyranny to the click track”? No, it’s not tyranny when it’s done deliberately and thoughtfully for expressive purposes, and not all the time. It’s like vibrato that way! Maybe other orchestral composers have been doing this for years – I have a limited knowledge of this portion of the repertoire over the past three decades. My few recent performances with electronics by other composers have still tended to be either all click track or all free, not such a fascinating combination of the two. Along these lines, it’s been very interesting watching the interaction between Mason Bates and Donato Cabrera. Maestro Cabrera’s instincts are sometimes to free up the vocal singing in places. However, he is letting composer Bates guide him back to following the alternation between free and locked as specified in the score. There is one other aspect I love about Mass Transmission besides its beautiful melodic, harmonic, and sonic writing. In an age that is so permeated by technology, it is sad that we get so little thoughtful artistic reflection on the impact of science and technology on our lives. John Adams’ opera Doctor Atomic was a milestone in that regard – the first act in particular contains an astonishing musical realization of the scientific mind in the throes of creation and problem solving. Mass Transmission shows how radio technology started to bring the world closer together even as people moved further apart. In a world filled with cell phones, Skype, and FaceTime we tend to take this for granted. Mass Transmission takes us back to a time when the technology was new, and people were experiencing the miracle of real-time, long-distance communication for the first time. Here’s hoping that more composers follow the path of these two mavericks, with other insightful and beautiful things to say. Mass Transmission will be performed by the San Francisco Symphony Chorus with Paul Jacobs on organ and Mason Bates on electronica, all under the baton of Resident Conductor Donato Cabrera. After this opening work comes the premiere of John Adams’ Absolute Jest with the St. Lawrence String Quartet as soloists. After intermission comes Morton Feldman’s Piano and Orchestra with Emmanuel Ax as soloist, and finally Edgard Varèse’s Amériques, the concert’s “golden oldie.” Michael Tilson Thomas will conduct the San Francisco Symphony in these three works. It will be an amazing concert, and tickets are still available. 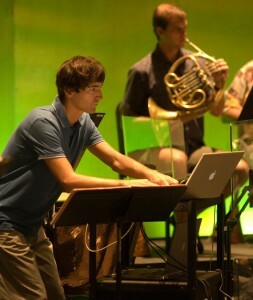 Photo of Mason Bates at Cabrillo by Ron Jones. This entry was posted in Chorus, MIT, Music, Technology. Bookmark the permalink.